Sor Juana Inés de la Cruz, O.S.H. (English: Sister Joan Agnes of the Cross; 12 November 1651 – 17 April 1695), was a self-taught scholar and student of scientific thought, philosopher, composer, and poet of the Baroque school, and Hieronymite nun of New Spain, known in her lifetime as "The Tenth Muse", "The Phoenix of America", or the "Mexican Phoenix". Sor Juana lived during Mexico's colonial period, making her a contributor both to early Mexican literature as well as to the broader literature of the Spanish Golden Age. 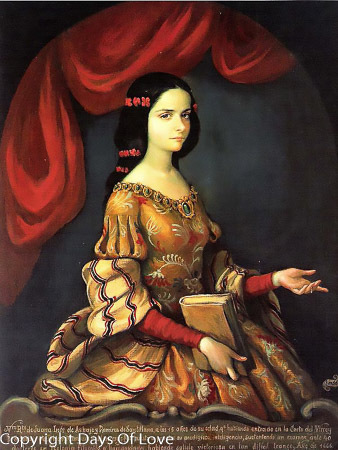 Beginning her studies at a young age, Sor Juana was fluent in Latin and also wrote in Nahuatl, and became known for her philosophy in her teens. Sister Juana educated herself in her own library, which was mostly inherited from her grandfather. After joining a nunnery in 1667, Sor Juana began writing poetry and prose dealing with such topics as love, feminism, and religion. Her criticism of misogyny and the hypocrisy of men led to her condemnation by the Bishop of Puebla, and in 1694 she was forced to sell her collection of books and focus on charity towards the poor. She died the next year, having caught the plague while treating her fellow nuns. She was born Juana Inés de Asbaje y Ramírez de Santillana in San Miguel Nepantla (now called Nepantla de Sor Juana Inés de la Cruz in her honor) near Mexico City. She was the illegitimate child of a Spanish Captain, Pedro Manuel de Asbaje, and a Criolla woman, Isabel Ramírez. Her father, according to all accounts, was absent from her life. She was baptized 2 December 1651 and described on the baptismal rolls as "a daughter of the Church". She was raised in Amecameca, where her maternal grandfather owned an Hacienda. As a child, Juana often hid in the Hacienda chapel to read her grandfather's books from the adjoining library, something forbidden to girls. She learned how to read and write Latin at the age of three. By age five, she reportedly could do accounts. At age eight, she composed a poem on the Eucharist. By adolescence, Juana had mastered Greek logic, and at age thirteen she was teaching Latin to young children. She also learned the Aztec language of Nahuatl and wrote some short poems in that language. In 1664, at the age of 12, Juana was sent to live in Mexico City. She asked her mother's permission to disguise herself as a male student so that she could enter the university there. Not being allowed to do this, she continued her studies privately. She was a lady-in-waiting at the colonial viceroy's court, where she came under the tutelage of the Vicereine Leonor Carreto, wife of the Viceroy of New Spain Antonio Sebastián de Toledo. The viceroy (whom Appletons' Cyclopædia of American Biography names as the Marquis de Mancera), wishing to test the learning and intelligence of this 17-year-old, invited several theologians, jurists, philosophers, and poets to a meeting, during which she had to answer many questions unprepared and explain several difficult points on various scientific and literary subjects. The manner in which she acquitted herself astonished all present and greatly increased her reputation. Her literary accomplishments garnered her fame throughout New Spain. Her interest in scientific thought and experiment led to professional discussions with Isaac Newton. She was much admired in the viceregal court, and she received several proposals of marriage, which she declined. In 1667, she entered the Monastery of St. Joseph, a community of the Discalced Carmelite nuns, as a postulant. She chose not to enter that order, which had strict rules. Later, in 1669, she entered the monastery of the Hieronymite nuns, which had more relaxed rules. She chose to become a nun so that she could study as she wished since she wanted "to have no fixed occupation which might curtail my freedom to study." In the convent and perhaps earlier, Sor Juana became friends with fellow savant, Don Carlos de Sigüenza y Góngora, who visited her in the convent's locutorio. She stayed cloistered in the Convent of Santa Paula of the Hieronymite in Mexico City from 1669 until her death, and there she studied, wrote, and collected a large library of books. The Viceroy and Vicereine of New Spain became her patrons; they supported her and had her writings published in Spain. She addressed some of her poems to paintings of her friend and patron María Luisa “Lisida” Gonzaga Manrique de Lara, Condesa de Paredes de Nava, daughter of Vespasiano Gonzaga, Duca di Guastala, Luzara e Rechiolo and Inés María Manrique, 9th Countess de Paredes, which she also addressed as Lísida. One noted critic of her writing was the bishop of Puebla, Manuel Fernández de Santa Cruz, who in November of 1690 published Sor Juana's critique of a 40-year-old sermon by Father António Vieira, a Portuguese Jesuit preacher./a> In addition to publishing that without her permission, under the pseudonym of Sor Filotea, he told her to focus on religious instead of secular studies. He published his criticisms to use them to his advantage against the Priest and while he agreed with her criticisms, he believed that as a woman, she should devote herself to prayer and give up her writings. IIn response to critics of her writing, Juana wrote a letter, Respuesta a Sor Filotea de la Cruz (Reply to Sister Philotea), in which she defended women's right to education: "Oh, how much harm would be avoided in our country" if women were able to teach women in order to avoid the danger of male teachers in intimate setting with young female students. She said that such hazards "would be eliminated if there were older women of learning, as Saint Paul desires, and instructions were passed down from one group to another, as in the case with needlework and other traditional activities." She famously remarked by quoting an Aragonese poet and echoing St. Teresa of Ávila: "One can perfectly well philosophize while cooking supper." In response, Francisco de Aguiar y Seijas, Archbishop of Mexico joined other high-ranking officials in condemning Sor Juana's "waywardness." By 1693, she seemingly ceased to write, rather than risking official censure. However, there is no undisputed evidence of her renouncing devotion to letters, but there are documents showing her agreeing to undergo penance. Her name is affixed to such a document in 1694, but given her deep natural lyricism, the tone of the supposed handwritten penitentials is in rhetorical and autocratic Church formulae; one is signed "Yo, la Peor de Todas" ("I, the worst of all women"). She is said to have sold all her books, then an extensive library of over 4,000 volumes, and her musical and scientific instruments as well. Other sources report that her defiance toward the church led to all of her books and instruments being confiscated although the bishop himself agreed with the contents of her letters. Only a few of her writings have survived, which are known as the Complete Works.. According to Octavio Paz, her writings were saved by the vicereine. SShe died after ministering to other nuns stricken during a plague, on 17 April 1695. Sigüenza y Góngora delivered the eulogy at her funeral.